Would you put your hands near this? Last week, we interviewed Rose Colored Gaming's Matthew "Wiggy" Wiggins about his unique range of console modifications. In the feature, Wiggins revealed that he gets quite a kick out of buying grimy-looking games and systems and then freshing them up for a new lease of life, and in a recent blog post on his site, we get to see just how extreme this process can be. The image below is a Game Boy Advance console that Wiggins ordered online. "This is how it arrived, in a stinky padded envelope, wrapped in a sticky grocery bag," he explains. "The buttons felt like they’re been soaked in Dr. Pepper and the power switch required a pry bar to slide, and it smelled like it had consumed an entire carton of Philly Blunts on its own." Astonishingly, the image below is the exact same console. The only parts Wiggins had to replace were the battery cover (which was missing in the first place) and the screen lens. Everything else is original. It's incredible to see the state that some people allow their hardware to fall into, and equally amazing to see the amount of effort that others put in to bringing it back to life. "I would actually feel comfortable licking this GBA at this point," admits Wiggins. Now that's having confidence in your work. And really, treating something like this so badly... it's a crime. Good he was able to fix it up. Nice restoration, it looks like new now! Well, I guess this person doesn't care what condition it comes in, because he could probably fix it and make it brand new again. 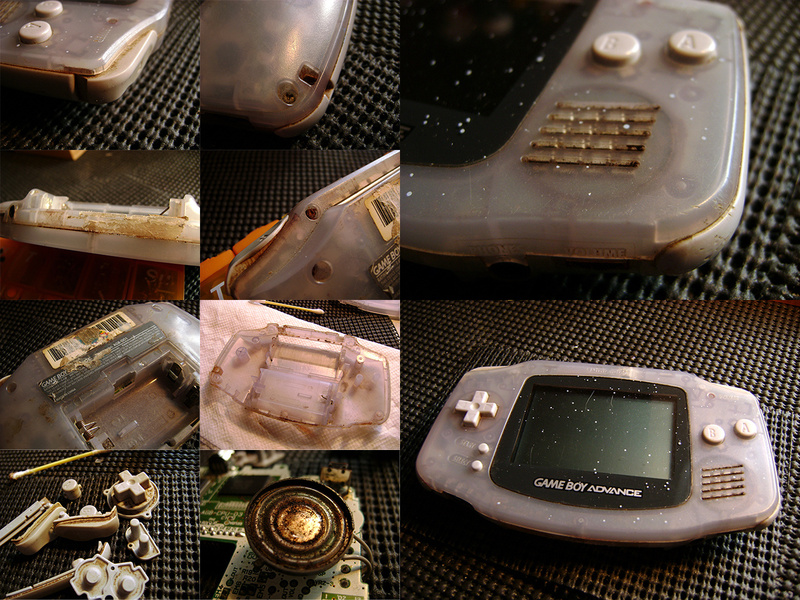 @rcmadiax It's a modded Game Boy Light, done by Wiggins himself. He applies new stickers to each unit he mods, and provides custom packaging too. Dude, you should see how I got a DS Phat that I bought second hand. Was in such a bad shape, that I didn't even use it more than a couple times. "I would actually feel comfortable licking this GBA at this point," admits Wiggins. Very nice indeed, Wiggins. It baffles me how some people just clearly don't care about their stuff. I like sprucing up NES, SNES, & GB/GBC games I get off ebay. I feel a great sense of accomplishment w/ every dirty game I make look like new again. @SethNintendo - Dear lord, that's NASTY! I worked used retail during the late 90's and early 00's, and I've seen my fair share of roach-infested SEGA Genesis systems, but that Wii takes the cake! @SethNintendo: Wow, that's messed up! He cleaned the GBA with his tongue. He was licking the GBA before, but now he's ACTUALLY comfortable doing that. Haha. Just kidding. I lick my 3DS and Gamepad, but only to clean the screens sometimes. My family says it's gross, but it's my stuff, and it works pretty well if you don't have water or cleaning stuff. I even clean my glasses like that. The owner of this GBA must have been playing it in the mud while eating cheetos. @KnightRider666 I was about to say the same thing. I like snooping around thrift stores and getting my finds looking like new again myself. @SCAR392 Why not just exhale on it instead? Thats what I do and the moisture from my breath works just fine. The question is - did he actually lick it? And how does it taste? Actually, will it blend? That is the question. Regarding how these systems get into this state. Generally it is kids who either forget or just plain don't wash their hands after handling sticky sweets and the like. Grubby hands onto system done multiple times leads to this sort of mess. I guess the plus is they tend to be very cheap for people who like to refurbish systems. 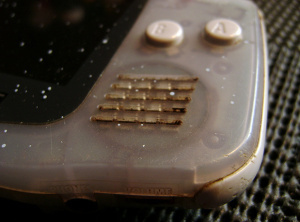 Decal covered DS systems are a similar place to look for potential bargains. Of course deriving some sort of enjoyment from cleaning the systems helps. The other fun ones are marker covered cartridges and/or labels. Probably my favorite is when passwords are written on the cartridge label. I can just imagine the password flashing on screen frantically looking for somewhere to write it, somewhere where it won't be lost...the cartridge itself. HOLY HOT DAM!! 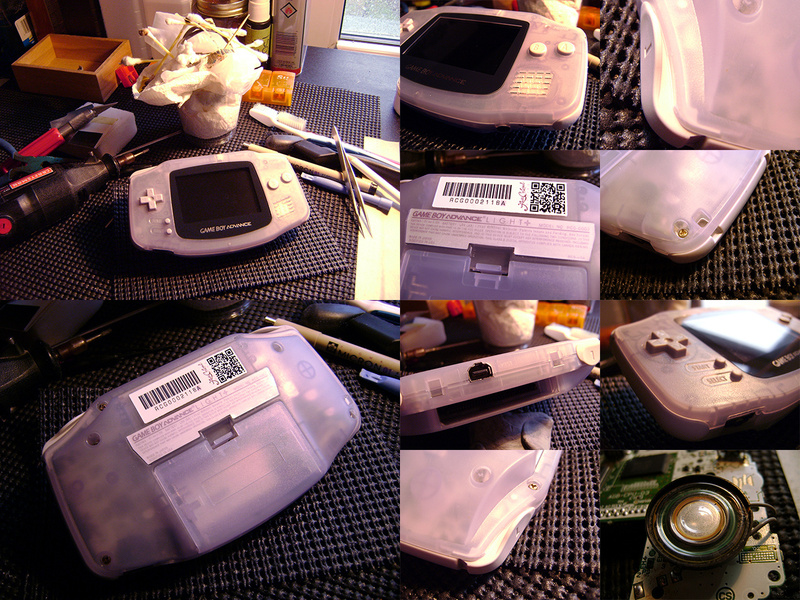 That GBA has saw some better days than what it looked like before this guy made it look good as new. I would NEVER , and have NEVER let anything like that happen to ANY of my past portables or consoles. Every maybe 3 days to a week, I take a nice warm rag with a bit of Windex and just clean my stuff off so it still looks like it's in good condition instead of looking like a grungy piece of mess. My first DS lite was a second hand one full of decals and sticky buttons, a bit of love and light chemicals and it came out good as new. But like starwolf said, it's usually kids who don't treat them properly. My nephew's DS is in a terrible state, he eats sweets and plays, leaves it lying everywhere, lost the stylus and the screen is very loose. Breaks my heart everytime I see it. The Wii was never underpowered then, it had the power to kill roaches! Sadly my GBA can't be saved! It still looks pretty sweet, but I guess the chips inside have been fried! Luckily I still have my Gameboy player! I get so mad when I see things in such a poor state! C'mon, don't your mother teach how to keep things clean and working? I still have my PSone from when I was a little kid, and it's in a perfect condition. Geez, to be honest, even my barbie's clothes are still perfect. And I'm 19. Anyway, what this guy did....I would never say it was in such a poor state. It looks brand new! I have one but i accidently smashed the screen and ireally dont want to replace it because my mom bought it for me right before she died so can you replace the screen and the projecter?